At Foodseum we're passionate about providing a fun learning experience that celebrates all aspects of food and inspires individuals to begin their own personal culinary adventures. Our team is built up of employees and volunteers dedicated to making the vision of a food museum a reality. There are currently no available volunteer opportunities, please check back soon! Chicago Foodseum does not and shall not discriminate on the basis of race, color, religion (creed), gender, gender expression, age, national origin (ancestry), disability, marital status, sexual orientation, or military status, in any of its activities or operations. These activities include, but are not limited to, hiring and firing of staff, selection of volunteers and vendors, and provision of services. We are committed to providing an inclusive and welcoming environment for all members of our staff, clients, volunteers, subcontractors, vendors, and clients. We welcome all Volunteers and Potential Partners! Here at Foodseum we welcome anyone who'd like to lend a hand to making our goals a reality! 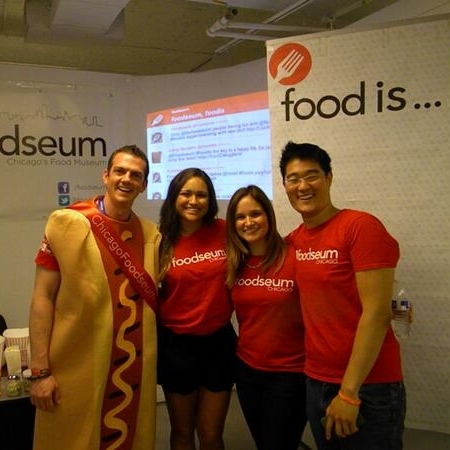 There are a ton of ways to get involved with Foodseum and every single one of them helps! Event Volunteers help us reach out to the community during Chicago's events and festivals! Guest bloggers create unique food related content to share with the world! Professional volunteers offer pro bono services to help make Foodseum a reality! Sign up for our newsletter and join in the fun!